Over the past year, Team Metabolic has gone through a lot of changes. We have doubled our staff; started new projects; and all under a new name! Part of those changes has been to form a close link with the University of Chester, where we have been able to recruit interns and volunteers, to support the services we provide to our Inherited Metabolic Disorders community. Recently, one of our wonderful volunteers, Sue, also did some fundraising for us. Sue Jones is a University of Chester student and an employee at Sainsbury’s Upton Wirral and gave up her spare time to volunteer with Team Metabolic at their office in Chester! The University of Chester works closely with local charities and organisations, to provide students with hundreds of different opportunities around Chester. 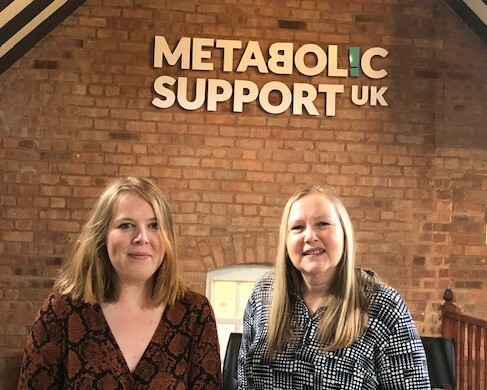 And this year, Metabolic Support UK were able to advertise some volunteering roles on the University of Chester’s volunteering portal, which is how the lovely Sue came to join Team Metabolic! Sue works with the Information Standards team and is helping ensure Team Metabolic provide our community with the most up-to-date information on the diagnosis methods and treatments of all the Inherited Metabolic Disorders. As part of the University of Chester’s volunteering scheme, students can record their volunteering hours and apply for an award in recognition of their volunteering commitments and achievements. Sainsbury’s also has a volunteering scheme called the Local Hero Award, which encourages colleagues to volunteer with a charity or within the community. For every hour spent volunteering, Sainsbury’s agrees to donate £5 per hour of volunteering to the charity or community group at which the Sainsbury’s employee volunteers, up to a maximum of £200 each year. Sue has been a volunteer at Metabolic Support UK since August 2018 and has now logged over 80 hours of volunteering, meaning she was able to apply for the Local Hero Award. Since then, Sainsbury’s have agreed to donate £200 to Metabolic Support UK! Thank you so much to Sue for all your hard work at Metabolic Support UK! Your support to the Information Standards team is invaluable and your initiative to apply for the Local Hero Award is hugely appreciated. The donation will allow us to continue to support more and more families and patients with Inherited Metabolic Disorders.